Low-Density Parity-Check (LDPC) codes are widely used from hard-disk systems to satellite communications. Sliding-Window Belief Propagation (SWBP) is an effective decoding algorithm of LDPC codes for time-varying channels and demonstrates near-optimal performance in many experiments. However, to adaptively find the best window size, SWBP may need very long computing time. Inspired by Graphics Processing Unit and Compute Unified Device Architecture, in this paper we propose a novel method to address the issue of SWBP’s computing complexity. 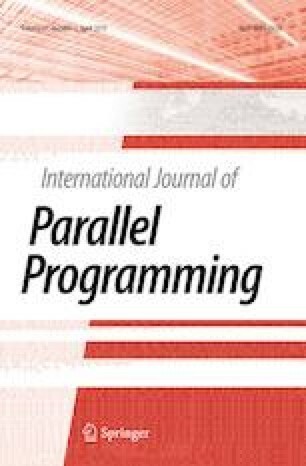 Different from sequential SWBP, we simultaneously compute the metrics of different window sizes in parallel, which enables us to quickly find the best window size. We use coalesced memory access to accelerate reading and writing processes. Registers and shared memory are also considered in our program to reduce memory latency. On the GTX 1080Ti platform, experimental results show that parallel SWBP can achieve about 14 \(\times \) to 118 \(\times \) speedup ratio for different regular LDPC codes, and about 8 \(\times \) to 120 \(\times \) speedup ratio for different irregular LDPC codes, respectively. According to the trend of our experiments, we strongly believe that, as the length of LDPC codes increases, a higher speedup ratio can be obtained. This work was supported by the Fundamental Research Fund for the Central Universities of China (Grant no. 300102249304), the Provincial Science Foundation of Shannxi, China-Key Project (Grant no. 2016JZ024), and the Provincial Foundation for Sci-Tech Youth Nova of Shaanxi, China (Grant no. 2014KJXX-41). We would like to thank colleagues in School of Information Engineering, Chang’an University, for their useful suggestions.